Once again, the Tauber Institute, in conjunction with the International Project Management Association (IPMA), is sponsoring a Project Management certification class and exam for graduate business and engineering students and staff. In order to participate, you will need to reflect upon a project management experience (for example: a work project, an engineering design experience/senior capstone, Ross' MAP project, Tauber team project, etc). If you cannot make it to the classes (due to project travel, MAP, or other another class), the sessions will be recorded. Homework (mastery verification) will be required after each session. The certification exam, administered by IPMA-USA is scheduled for November 17, 2019 (11:00 - 3:00 pm) at the Ross School of Business. Successfully passing the exam will yield IPMA's Level D certification (Certified Project Management Associate). Over the last two years, all students who have taken the exam have passed! Project Management is a powerful skill set to have in your toolbox as you look for full-time employment! NOTE: The $500 (for non-Tauber students) or $150 fee (for Tauber students) is non-refundable. HOSTED BY: Tauber Institute for Global Operations. For questions about this event, please contact tauberinstitute@umich.edu or visit tauber.umich.edu. What is IPMA Level D® (Certified Project Management Associate)? The IPMA Level D is an internationally recognized entry-level qualification in the area of project management. This designation, which demonstrates the individual's ability to understand the basics of project management, is similar to the exam-oriented, knowledge-based certifications of other major Project Management associations. For many, Level D® is the first step towards a professional project or program manager role. It is the first step in a sequence (C, B and A) to be earned by demonstration of success in larger PM responsibility sets. 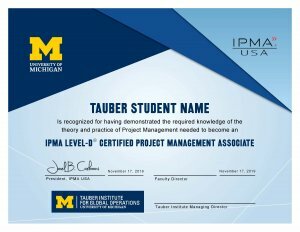 U-M Tauber students pay $150 for the Level D® certification test; non-Tauber students pay $500.